A notable motor yacht comes on the market as Noell Vawter at Worth Avenue Yachts sends word that he's joined forces with Michael White and Peter Thompson at Ocean Independence to list Picchiotti's 46m motor yacht Golden Compass for sale. Golden Compass was the worthy winner of the Voyager’s Award at the 2012 World Superyacht Awards following an amazing 30,000 nautical mile world tour. Built in 1982, she's been consistently maintained and upgraded since, including major refits in 2009 and 2011. 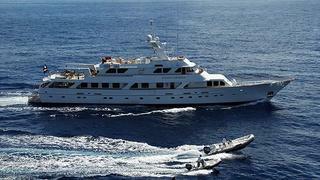 Available to view at the Fort Lauderdale Show, Golden Compass is asking $7.9 million.